The American Athletic Conference has provided some of the friendliest fantasy matchups all season, and now is not the time to stop seeking roster upgrades outside of the Power Five conferences. The Mustangs welcome the Golden Hurricane and are big favorites at home. Hicks averages 309 passing yards and 2.5 touchdowns in games versus FBS opponents this season. The Tulsa pass defense ranks #123 and has allowed 13 aerial strikes. The SMU signal caller assuredly hurls three touchdowns on Saturday. While leading the Mean Green offense to 60 points scored over the past two weeks, Mason Fine stands among the top 15 college fantasy quarterbacks, accumulating 637 passing yards and five touchdowns. For the season, Fine has recorded 18 total touchdowns and over 2,000 yards in the air. The sophomore continues his fantasy-worthy performances against the Monarchs this weekend. New offensive coordinator Rhett Lashlee implemented an up-tempo offense, and the Huskies are scoring over 27 points and passing for over 300 yards per game. In three home games against FBS opponents, Shirreffs has thrown for 1,088 yards and five touchdowns this season. As a 13-point underdog at home, the game script foreshadows a ton of fourth quarter passing for Shirreffs versus a defense, which surrenders 39.1 points per game. Since Mark Walton suffered a season-ending injury, Travis Homer has proven to be a worthy successor. In back-to-back games, the sophomore has earned 20 carries and rambled for 265 yards and two touchdowns. He has also been an asset in the passing game with six catches for 45 yards and a score. North Carolina ranks among the worst run defenses in the nation, and coach Mark Richt will exploit the Tar Heels’ weakness with Homer. The Wolverines have a nearly non-existent passing game: Michigan averages less than 200 passing yards per game and rank #103 in the country. Coach Jim Harbaugh has not been able to find a bell cow ball carrier since he took over in 2015. In each of the last five games, Karan Higdon has garnered double-digit carries and rushed for 405 yards and five touchdowns. It is not a great matchup for the Michigan ground game, but the junior runner should receive the majority of touches against the Scarlet Knights. A dreaded two-headed committee for the Rams might scare off some college fantasy diehards. Nonetheless, both runners manufacture solid numbers. Over the last three games, the backfield duties have been split evenly: Dawkins has 50 attempts for 383 yards and a touchdowns while Matthews has logged 51 carries for 237 yards and three touchdowns. The Air Force run defense does not provide much of an obstacle (241.3 ypg. and 19 touchdowns allowed), and Dawkins and Matthews undoubtedly combine for 200 rushing yards and two touchdowns. Coming off his poorest game of the season, college football managers may be reluctant to place the Cavaliers’ playmaker into lineups. Zaccheaus qualifies at running back and receiver and lines up all over the formation for Virginia. He has 647 yards from scrimmage and five touchdowns this season. The Panthers surrender 29.6 points and 434 yards per game, which Zaccheaus should be able to take advantage of this Saturday. Anytime Las Vegas identifies a game with an expected 73 points scored, rosters of both clubs must be examined in detail. As 20-point underdogs on the road, the Red Raiders should be playing from behind the entire second half, and QB Nic Shimonek might throw 60 passes against the Sooners. 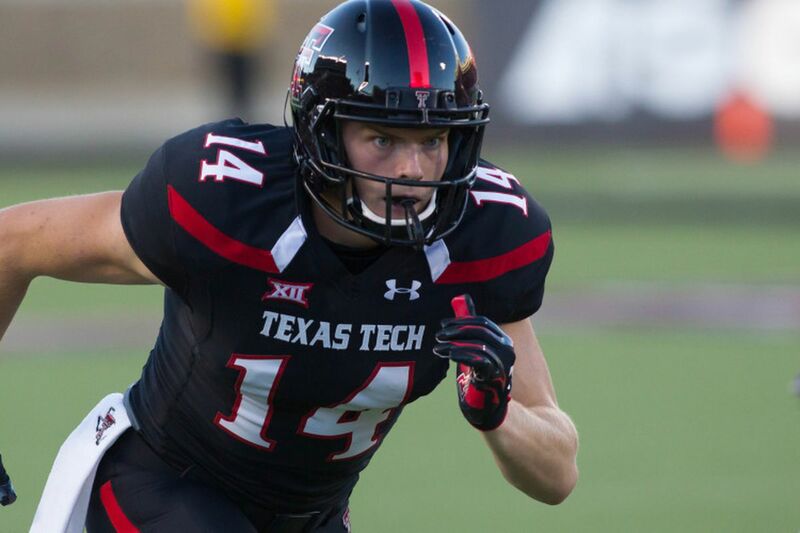 Dylan Cantrell is second on the team in all the receiving categories and will likely be peppered with at least 12 targets. He is still available in many leagues and well worth starting.